Fixer (Paul Ebersol) a.k.a. 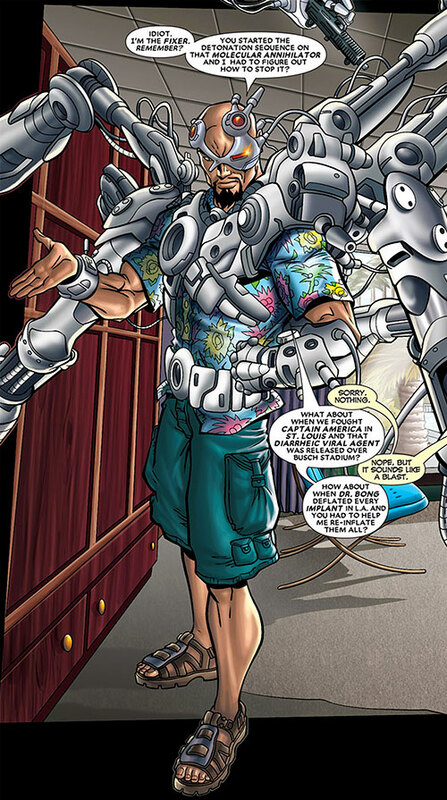 Techno is a minor Marvel Comics villain and techno-genius. Though not a major character he has been around since 1966. His classic Fixer career (not yet written up). His time as the fully robotic Techno, covered in another profile. Real Name: Paul Norbert Ebersol. Group Affiliation: Thunderbolts ; formerly Hydra, Masters of Evil, Redeemers, and partner of Mentallo. Height: 5’8” Weight: 160 lbs. Eyes: Brown Hair: Bald, with black goatee. An engineering genius, Fixer is one of the foremost inventors of his time. He can turn his mind to solving almost any scientific problem. He tends to be better at adapting and improving on existing technologies, rather than developing new breakthroughs, and is capable of fixing almost any technology he encounters. He wears a tech-pack, which is linked to his mind, allowing him instant control over it. He can use it to produce technological gadgets out of its own mass, which may be separate or remain a part of the tech-pac, or from metallic or technological matter he finds around him. The pack also allows him to communicate with, and control, other machinery. It can automatically fix damage that the Fixer takes, such as instantly cauterizing gunshot wounds. The pack has an array of sensory powers, including thermal vision, radio wave detection, and olfactory sensors. When encountering hostile or interesting situation, he will, if he has the time, produce additional sensory equipment, appropriate to the situation, so as to give him a better understanding of what’s going on. He also has an emergency backup unit hidden about his person, which allows him to interface with technology. Ebersol was a child prodigy in mechanics, taking apart and repairing an alarm clock at age 3. By 10 he had built a small electric car, and by 13 a complex robotic arm. Dropping out of high school due to lack of interest, he went through a procession of jobs. He was unable to keep them due to his personality and unwillingness to follow others’ procedures. Finding stimulation in planning and committing crimes, he eventually offered his services to Hydra. He saw the opportunity of developing cutting edge technologies for them, without the limitations placed on him by more legal organisations. He had a long career as a supervillain, on his own, as a member of Hydra, partnered with Mentallo, or as a member of different iterations of the Masters of Evil. When most of Earth’s heroes seemed to die fighting Onslaught, Ebersol was recruited by Baron Zemo to join his new Masters of Evil. 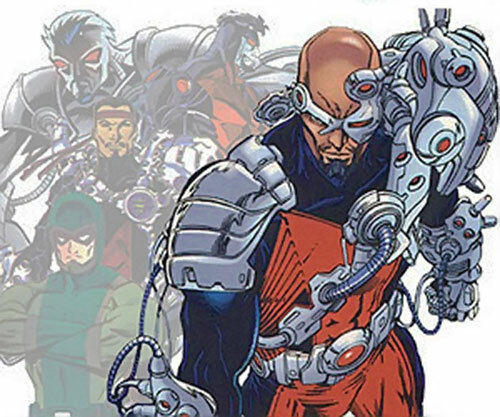 Zemo changed their names, costumes, and appearances debuting as the new hero group, the Thunderbolts. Fixer adopted the new name of Techno. Not long after the group’s debut, they came up against the Elements of Doom, and most of the group was captured. An escape attempt was interfered with when the Element Iron caught Techno by surprise, snapping his neck. When Techno’s lifeless body was dumped on a pile of discarded electronics, contingencies in his Tech-Pack created a mechanical body into which a copy of his mind was installed. Following the death of his mechanical body, contingencies downloaded his consciousness into a prepared clone of his original body. Before it was fully prepared, his new body was woken by SHIELD agents, who had discovered Zemo’s base in which the body was stored. Damage to the body required him to wear his Tech-Pack to allow him to retain his movement. 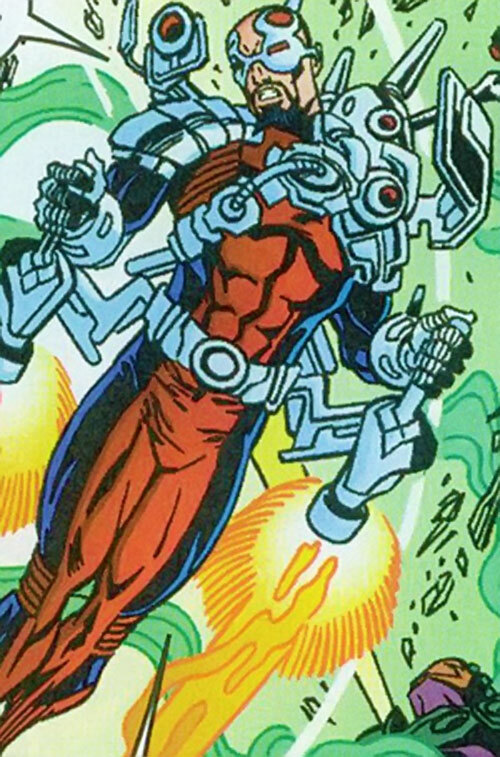 Controlling his Tech-Pack, SHIELD forced him to become part of the Redeemers group they had assembled, alongside Citizen V (John Watkins III), Beetle II, Meteorite (Valerie Barnhardt), Scream and Smuggler (Conrad Josten). The Redeemers were sent to try to foil Henry Gyrich’s plot to take control of all superhumans using a nanite virus. They were caught by surprise, infected with the nanites, and forced to protect him from the Thunderbolts. They were later freed from his control, only to discover that Gyrich himself had also been infected by similar nanites, and was acting under someone else’s control. When the Thunderbolts were offered pardons, provided they stopped costumed activities, Jolt and Charcoal joined the Redeemers. The group took up residence in the Thunderbolts base in Mt. Charteris. Captain America temporarily replaced Citizen V. During this time the group travelled to Latveria. There they had to fight the Young Allies from Counter-Earth, who were threatening eco-terrorism against Doom’s homeland. Soon after Citizen V returns, Fixer, felling challenged by Ogre hiding in a tesseract linked to the Mt. Charteris, manages to draw his hidey-hole back to Earth. In so doing he released the extremely dangerous Humus Sapien, a mutant who would drain all life on the planet. Ebersol’s convinced to travel to another, lifeless, dimension, to spare the Earth. As soon as the Humus Sapien left Earth, the side of the mountainside around their base was ripped off by Graviton. Disappointed at not finding the Thunderbolts, he settled for taking it out on the Redeemers. After Graviton crushed Charcoal into dust, ripped Jolt’s electric body apart, sent Meteorite to her death in orbit, and took the Smuggler into the sun’s orbit, the Fixer fled, leaving Beetle to her death. Ebersol was intercepted by Moonstone, who had been working as Graviton’s therapist. She recruited Fixer to serve Graviton. The other Thunderbolts (Songbird, Mach-3, and Atlas [Riordan/Josten]) turn up to help the re-formed Jolt battle Graviton. During the fight, Fixer discovered that Graviton’s energies were being drained away by some other-dimensional force. They worked out that Graviton’s servant, M’Reel, was using Graviton to open a portal for his race to invade Earth. Fixer and Moonstone rejoined the other Thunderbolts. Zemo’s mind, which had been inhabiting Citizen V’s body, took up residence in Fixer’s tech-pack, thereby gaining control over him. 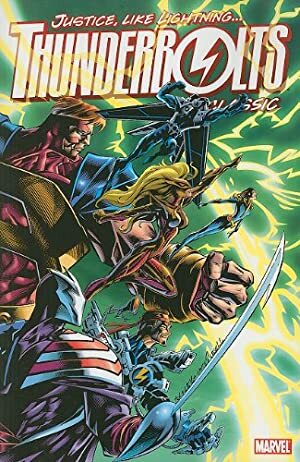 They managed to repel the invasion, but in closing the portal, which threatened to destroy Earth, the Thunderbolts, apart from Songbird, were transported to Counter-Earth . While travelling across Counter-Earth, planning to hijack a space shuttle to get back to their Earth, the Thunderbolts realised how desperate the situation was. They helped out where they could. When they discovered the shuttle flight was actually being used for a less than noble purpose by this world’s Thunderbolts, they stopped it. They also revealed its true purpose, controlling communications worldwide, and overthrew the other Thunderbolts. Fixer helped Zemo take over the body of Counter-Earth’s Helmut Zemo. Deciding to do what they could to help the people of Counter-Earth, the Thunderbolts discovered the city of Attilan. They turned it into a flying city, on which they gathered refugees from the worst hit parts of the planet. When disaster threatened the planet, the Thunderbolts teamed up with the Young Allies to try and prevent it. They succeeded but all the Thunderbolts, except Jolt, were transported back to Earth. 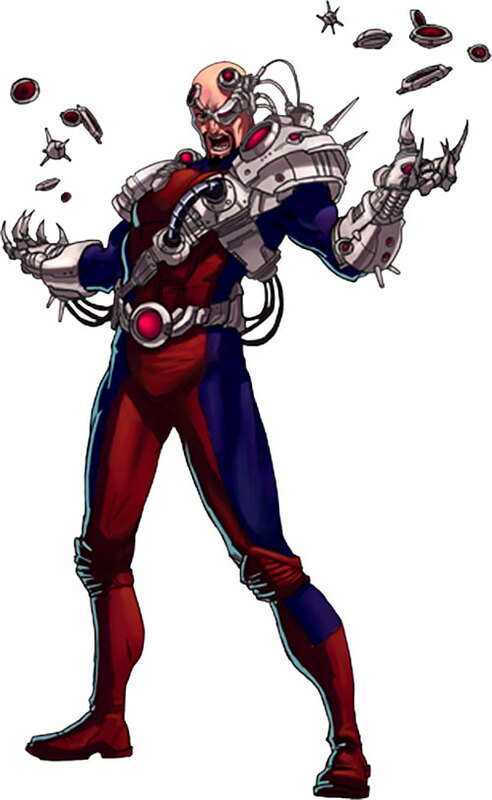 Ebersol remained with the Thunderbolts, helping Zemo build a machine for draining all extra-normal power sources on the planet, including a number of super powers. This brought the team into conflict with the Avengers, who distrusted Zemo’s motives. When Moonstone hijacked the absorbed energies, the power drove her insane. The two teams had to work together to subdue her, and prevent her destroying the planet. The Thunderbolts were disbanded soon after. Fixer was later approached at his Florida house (with naked Avengers painted on the side of the pool) by Deadpool. The merc with a mouth hired him to help bond a new techno-organic mesh to the badly injured Cable. He was then recruited by Zemo to help deal with the danger presented by the powerful Photon, who was at the time a member of the New Thunderbolts. 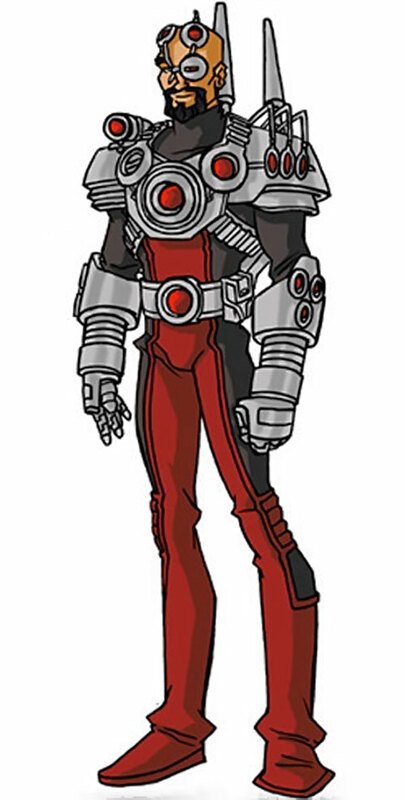 They also recruited Mach-IV, and Blizzard, both of whom had had to leave the group, and Man-Killer. Working with the government on the operation, Zemo was also allowed custody of Moonstone’s comatose body, and that of the brain-dead Blackout. This allowed them to recover Smuggler II from the Darkforce Dimension . They confronted the Thunderbolts, and managed to deal with Photon. They then combined their forces, rejoining the Thunderbolts. Snarky, arrogant and egocentric, the Fixer is fully aware of how talented he is. He makes sure that everybody else understands it as well. His abrasive personality made it difficult to form relationships with people, and he eventually gave up trying. 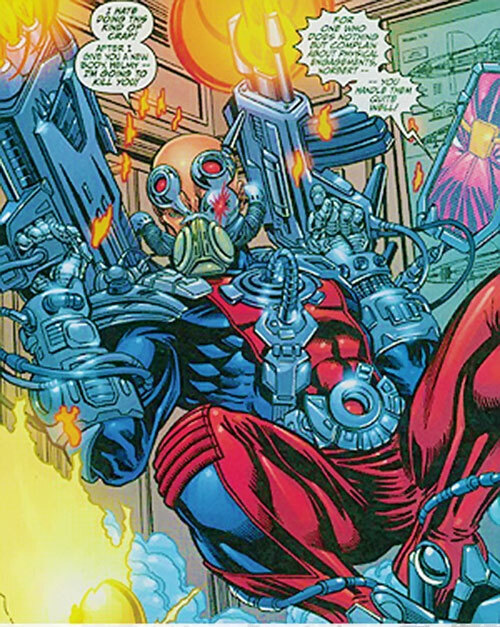 During his time with the Thunderbolts, he actually developed feelings for his team mates. But he didn’t start to accept this (if he ever has) until he’d been away from them for a while. He enjoyed being around them, even if disguised as Ogre, and eventually risked his life to give Jolt a second chance at life. When revived in his new body, he was still trying to come to terms with his actions. So he pretended to not have any of the memories from his time in a robotic body. The Fixer is a problem solver, thinking in the short term and focussing his attention on fixing or improving mechanisms, especially if it can get him the respect he feels he deserves. He lacks long-term goals, and will generally follow anyone who offers him interesting technical problems, and who respects his abilities. He has no interest in world-conquest, being happy enough just fixing difficult problems and having his genius recognised. While not a coward, if the Fixer sees a situation as being unwinnable, he’ll flee, even if it means abandoning team mates. Expertise (Cloning), Genius, Scholar (Sensor technology). Thunderbolts (High), Baron Helmut Zemo (High), Mentallo (Low), Underworld (Low). MIA (Fixing things), Socially Inept. TECH-PAC [BODY 10, Analytic Smell/Tracking Scent: 06, Chameleon: 04, Fabricate: 15, Interface: 12, Matter Manipulation (Limited to metals, and is Contingent on Fabricate): 18, Super Hearing: 08, Thermal Vision: 06, Stabilization]. BACK-UP TECH UNIT [Body 05, Interface: 10]. 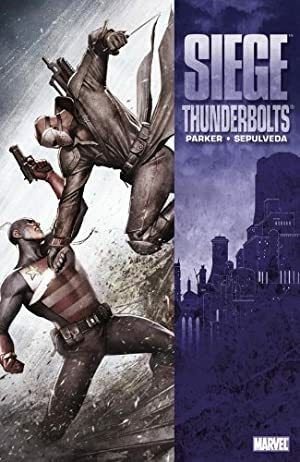 Helper(s): TalonMail (whose early write-up of the character was used as a rough basis), Chris Cottingham, Peter S Piispanen, KalEl el Vigilante, marveldirectory.com .